The 3D printed prosthetics have proven to be popular in both the United States and the UK, they are still slowly picking up in other countries where the use of 3D printing is still in a relatively young stage - particularly in Eastern countries including China. 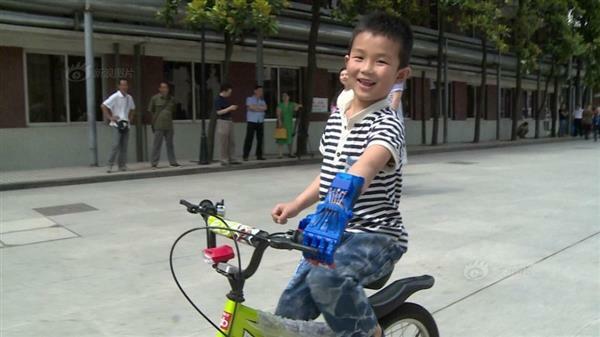 Clenching his fist as he strikes an action pose, a six-year-old boy from central China, who lost half a hand in a traffic accident, has become one of the first patients in the country to don a 3D printed limb. In a country where a medical bill is often more deadly than sickness itself, technology is bringing a change to the less fortunate families. The 3D hand costs a hundred times less than a typical prosthetic limb. 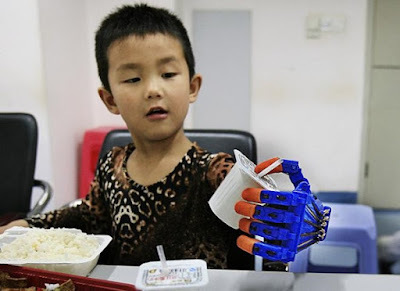 The youngster, known as Xiao Cheng, was thrilled to use his robotic hand for the first time after a hospital gave it to him as a gift for the Children’s Day, reported People’s Daily Online. Because of the nature of Cheng’s injury - he had to have a part of his hand amputated and thus, lost most of the feeling in the rest of hand - any sort of a replacement would have cost much more than his family was capable of affording; both of Cheng’s parents have moved to larger cities to find work while Cheng is cared for by his elderly grandma who farms every day to support the family. After hearing about Cheng’s story, doctors at the Union Hospital in Wuhan - a city 130 miles away from Cheng's village - decided to help. Using their expertise and 3D printers, the doctor’s created a prosthetic hand for Cheng that took just seven hours to complete. 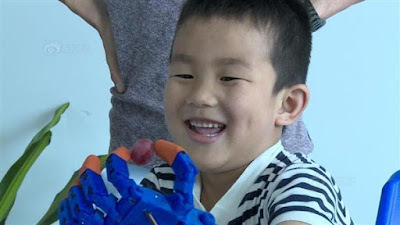 Upon receiving the prosthetic hand this past week, Cheng was so overjoyed that he decided to name the hand his ‘Transformers’ hand inspired by the action film that features robots that can transform into different objects. Considering that a traditional prosthetic limb can cost around 100,000 Yuan (£10,500 / $16,000) - or twice the annual salary for the average Chinese worker in rural areas - it becomes clear just how much of a gift receiving the hand was for Cheng and his family; the 3D printed prosthetic cost just 1,000 Yuan to manufacture. As if the story couldn’t be any more heartwarming, the hospital even promised to regularly replace the hand until Cheng reaches adulthood. Today, Xu Guisheng and a few partners have established a team that aids in creating custom 3D printed prosthetics for patients of all types. "A medical revolution caused by 3D printing has begun,” said Wang Chentao, a professor of Digital Medical Engineering Research at Shanghai Jiaotong University. “Compare to traditional manufacturing methods, the medical community has an innate kindness for 3D printing." According to Xu Guisheng, he and the team are prepared to provide 3D printed limbs to the public as a community service project and will be giving them out for free. Additionally, he has been in talks with the country’s various welfare organizations to help pay for any costs for future 3D printed limbs that are created for those that are in-need, such as low-income and disabled patients. "In the medical field, 3D printing technology has a very big market space.” Xu Guisheng added. "We have applied for several patents using 3D printing in the medical field. Artificial limbs are just one of the areas we applied and we are not relying on them to make a profit." One potential hurdle that Guisheng sees is regulations surrounding Chinese medical devices; according to current Chinese medical regulations, the implantation of human organs or tissues has a difficult approval process. "In accordance with existing regulations, the use of 3D printed prosthetic limbs is questionable because the production technologies are different than traditional manufacturing techniques." Xu Guisheng said. However, Wang Chunren, a food and drug inspection researcher noted that the use of 3D printing material for medical use is different than what the medical regulations are referring to; because there are no mechanical properties or internal structure, the standards do not apply. 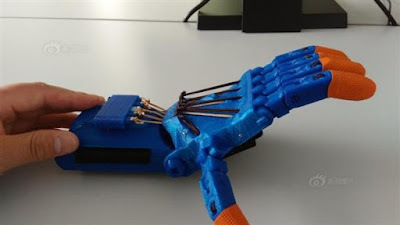 With the rise of 3D printing in general in China, it might not be too long from now where we see an entire 3D printed prosthetic revolution similar to what we’ve seen in the United States and the United Kingdom.